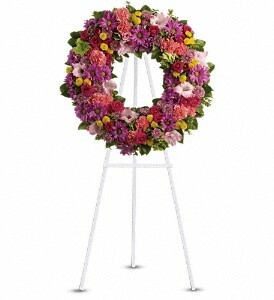 A standing wreath of dazzling flowers such as green hydrangea, hot pink spray roses, pink gladioli and carnations along with a mélange of multi-colored daisy spray and cushion spray chrysanthemums and greenery is delivered on an easel. If this is the arrangement you’d like to send, please fill out the form below. All flower arrangements will be delivered to Matthews Funeral Home. Enter in your email address so we can send you a confirmation. Please give us the deceased’s name and be sure to type in your message for the card in the space provided. Fill in your credit card information on our secure site. We process all payments through Stripe and we do not store any credit card information on our servers. Your information is private and securely processed via Stripe. We have an SSL certificate, look for the lock symbol in your browser. If you have any questions, please call us at 405-341-2787 during business hours. 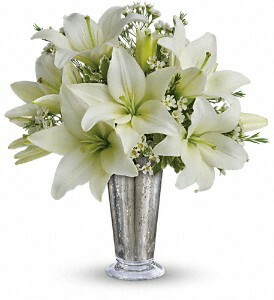 Order flowers from our local florist and have them delivered to the funeral home for free. We regularly post helpful and relevant articles as well as let you know about community events in Edmond. We welcome the opportunity to be able to help anyone that is in need of support in recovering from a loss, no matter who they are. Please click to go to our Grief Groups page, where you can search for a group that is free to you and your loved ones.